Servus and welcome to our little Christmas surprise Kerstin has prepared for you! 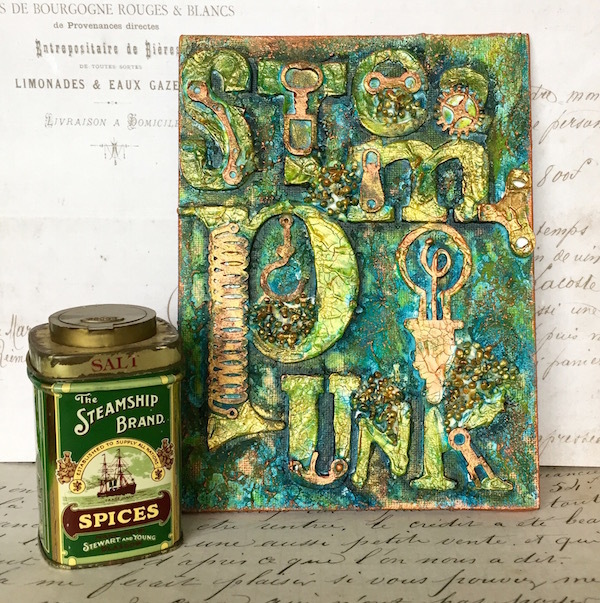 Our actual December challenge is in full swing and you still have time to play along until the end of December - if you need a bit of inspirational input, just check out the challenge post HERE. But enough of the ordinary challenge talk - let's raise the curtains for Kerstin and Mister Coolman! Welcome, ladies and gentlemen! 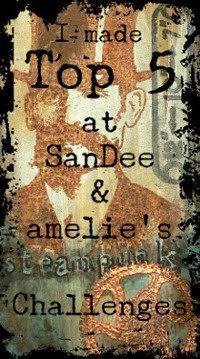 Kerstin here to share the last post for this year over here on SanDee&amelie's Steampunk Challenges! ...and then Kerstin took away my hat to paint it black. Luckily it was glued back on - imagine how I would have looked without a hat!!! ME!!!! ...and given a tie, two snap fasteneres as eyes, a nose made from an old clockwork and a fancy moustache (that once was a pin). Before I got my arms and some other embellishments, Mistress Kerstin let it snow (using DecoArt SnowTex) because after all deep within I am a true snowman, right? 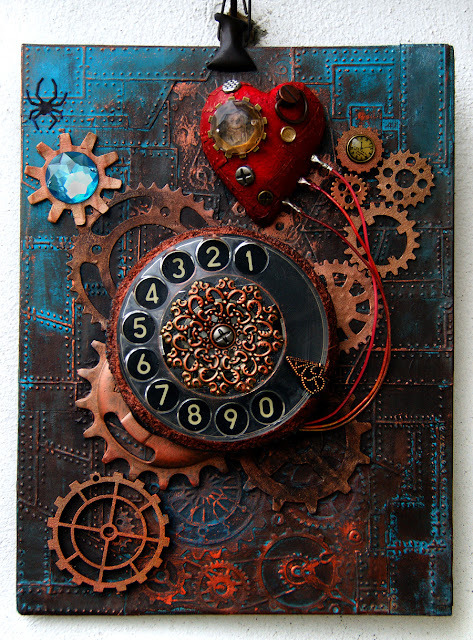 My arms were made from gears and cogs from an old taken apart clockwork - of course these had to be artificially rusted to match my cool steampunk outfit and as always that worked pretty well with the fab DecoArt media paints! And so I could be enlightened now and then I also got a lightbulb from old Christmas tree fairy lights. I even got wired so it can be lit!!!! That's it so far about my making. If you want to learn more about it or my maker, click here. " May the spirit of the season bring you happiness and joy! from me and the whole DT! Servus and welcome to today's announcement of our Top 5 and prize winners from the November challenge! I'll make it short today as our internet connection is quite slow today (and is having hick-ups too), so just a few reminders before I present the winners of the DecoArt media and boozybear prizes. Our actual challenge has gone live on the 1st and if you haven't checked out the whole (!) team's makes you can do so HERE. 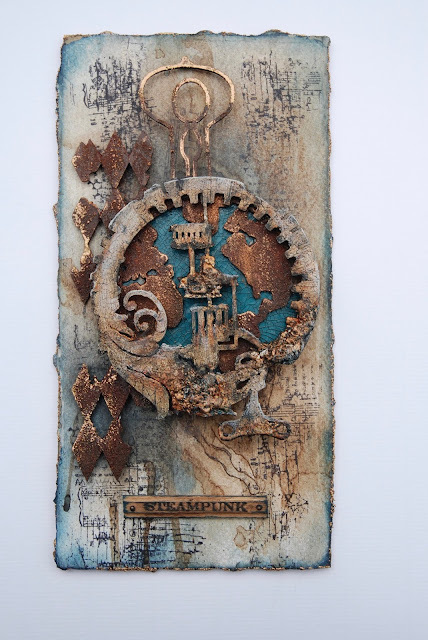 It is an "Anything Goes - Steampunk/Industrial" (but Christmas projects with just a tiny hint of steampunk or industrial look are welcome too of course)as usual and open until Dec. 31st. 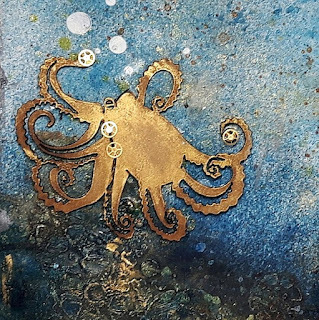 Kerstin will spread a bit of Christmas magic on the 17th - so make sure you stop by to get a good dose of wintery, glittery Steampunk wonder. Congrats on your wins, ladies! Please, contact me via email (see side bar) so we can arrange everything! DecoArt prize winners, please, include their phone numbers as well for shipping to your place. Thank you so much for sharing your fab makes with us, ladies, and huge congrats on making our Top 5!!! Please, feel free to grab the Top 5 badge for display on your blogs! 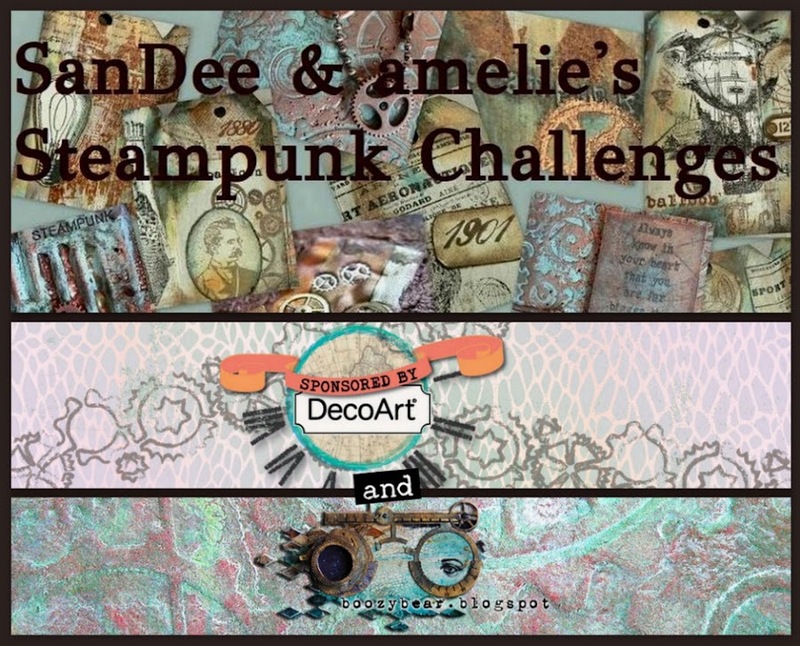 December 2016 Challenge at SanDee&amelie's Steampunk Challenges! 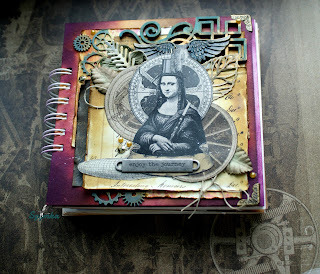 Servus, salut, hi and welcome to the release of our challenge for December, dear and true steampunk craftin' friends!!! 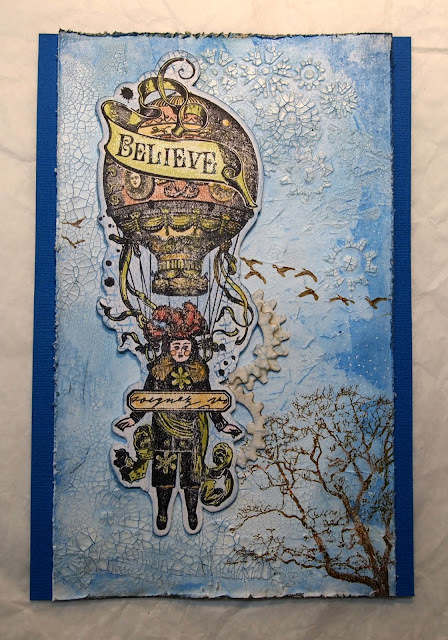 Today's post is quite picture heavy and extremely loaded with inspiration as for this month we decided to do just one challenge post - uniting the whole DT in one spot so to say. The team and I had such an amazing year - thanks to all your constant, beautiful and imaginative projects you have been sharing with us!!! 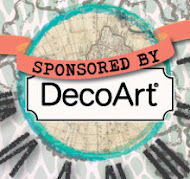 It is you (and my fab team and our generous sponsors) who make this place the special spot it is and for that I want to say a huge THANK YOU SO MUCH FOR PLAYING ALONG AND SHARING YOUR WONDERFUL MIXED MEDIA ART with us! The team and I wish you a wonderful advent season and hope that you will be able to at least squeeze in a tiny project for our December challenge - but mainly we want you to enjoy Christmas preparations (so if the project you enter is mainly Christmassy with just a tiny hint of steampunkery that is absolutely fine with us!!!). 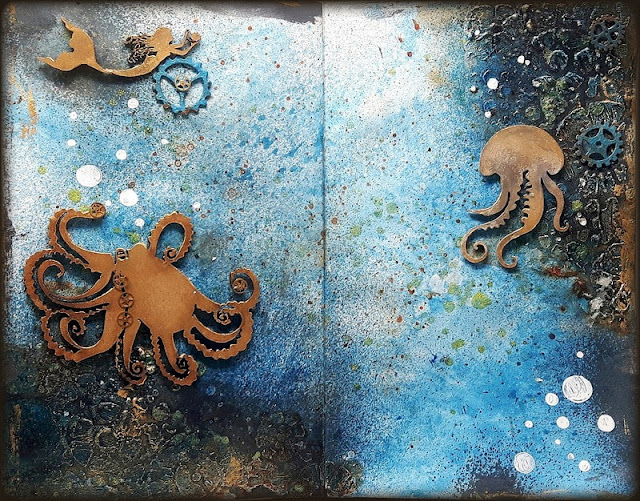 I also have the special pleasure to introduce to you today our wonderful new DT member, Alexa Czar from Alexa Czar's Art Blog! 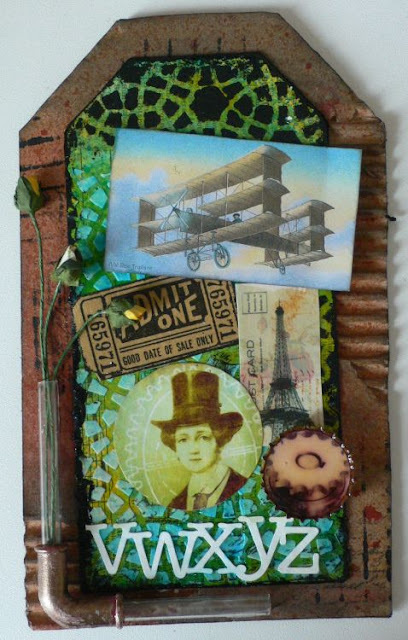 Please, give her a warm welcome and check out her blog - I promise you will find loads of wonderful inspiration there! Servus and welcome to SanDee&amelie's wonderful steampunk community, Alexa! We're so happy to have you with us now and we hope you feel at home and will have a wonderful time! themed one (though Christmas themed projects are welcome too - as long as they have a bit of an industrial or steampunk twist!). It will be open until the end of the month and there are - as always - two prizes to be won, donated by our generous sponsors DecoArt media and boozybear! All you have to do is enter a project and get eligible (please, check out our few rules if you are new to our challenge blog to avoid any frustration). 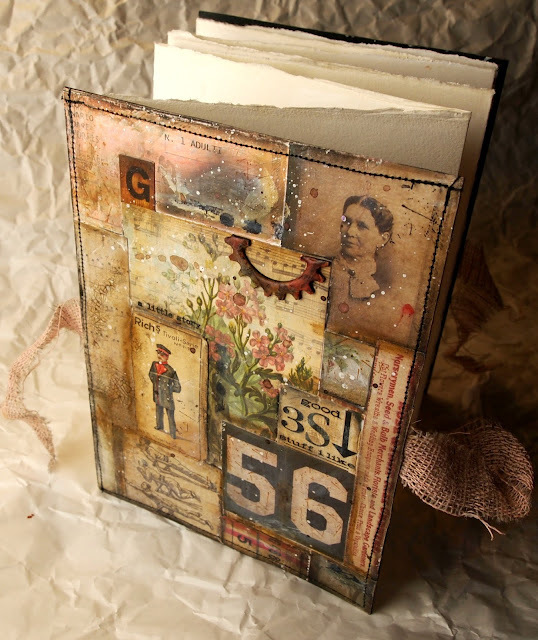 has created this wonderful journal spread to share with you as her first DT project! Look at all the lovely texture and colours! She also added a bit of festive bling by using real watch parts! How clever is that! 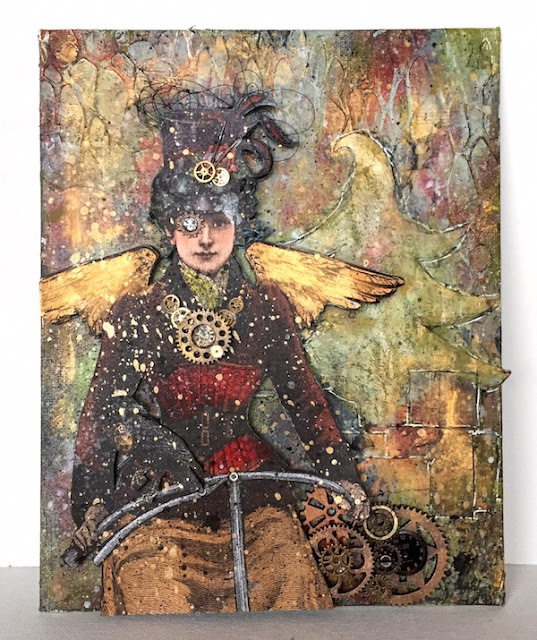 mixed media canvas with this awesome Steampunk Christmas Angel is just amazing, isn't it? made this awesomely imaginative "explorer ant" from recycled materials!!! "It is not for Christmas, but I couldn't stand... 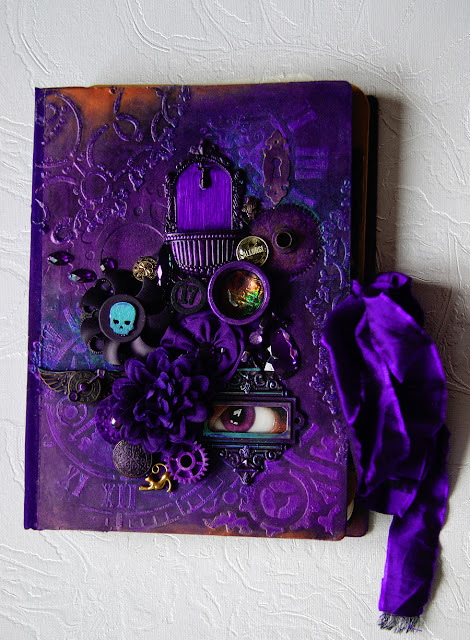 I'm mad about Dioxazine Purple, so I painted my new art-journal cover in these vibrant colour!" 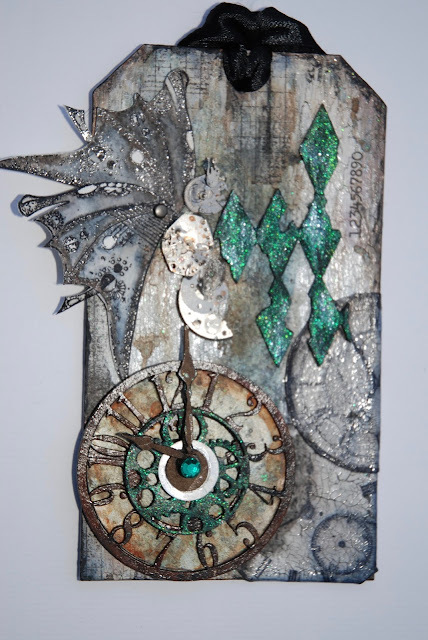 Stampendous glitters for a Christmas feel. 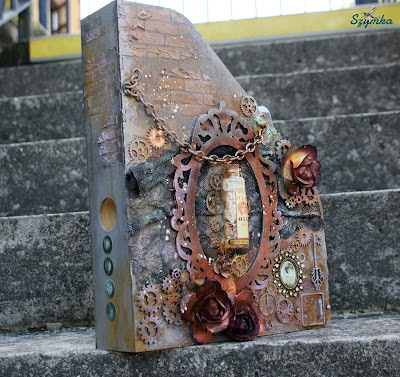 When I saw this wonderful mechanical wing steampunk chipboard set from boozybear I knew instantly that I wanted to create a canvas showing the wing of a (slightly different) Christmas angel for our December steampunk challenge. Of course there had to be a bit of bling as well! 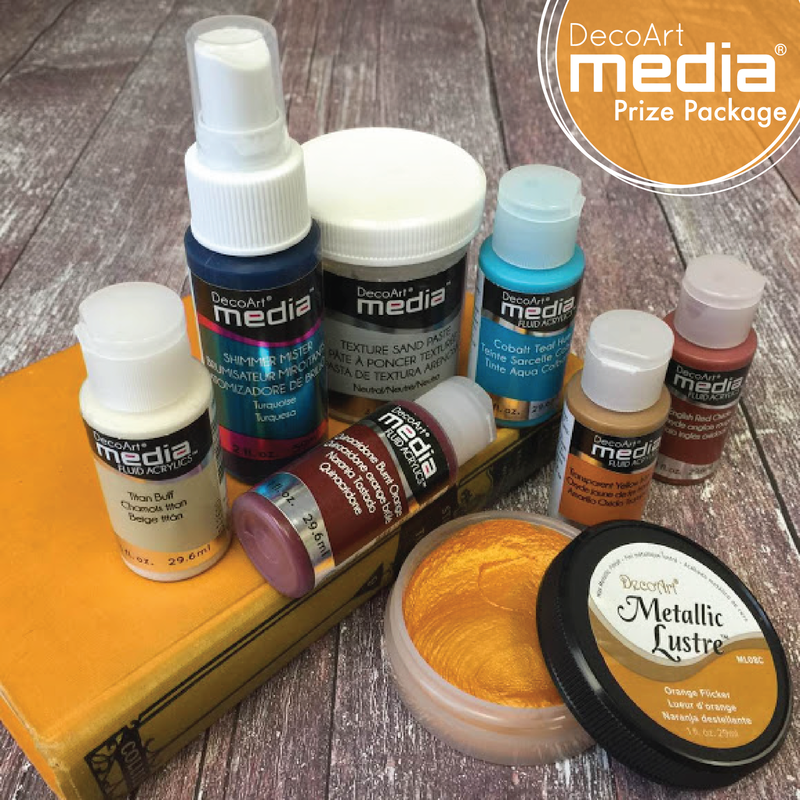 The November prize winners and Top 5 will be announced on Saturday, 10th December! So there's another date to mark on your schedules! 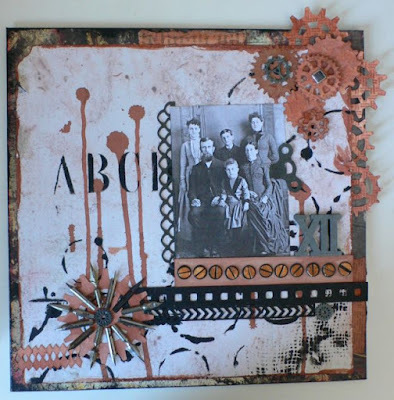 We wish you a good time happily crafting away for Christmas and hope you will nonetheless join in our challenge with a short make - maybe even one that combines the Christmas or winter theme with steampunk or industrial styles. We're curious to see what you will come up with!